Matt and Amy have served with Josiah Venture since 2010 through English camps. They joined JV in the Czech Republic in December 2011 and transitioned out of full-time ministry in Colorado. 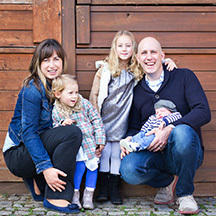 After Matt completed his M. Div and ordination into the EPC, they moved to Czech to serve in Ostrava with their four children, Hannah, Caden, Asher, and Hayes. They relocated again, 18 months later, to the western side of Czech (known as Bohemia) to a smaller city, Pisek. Matt and Amy have developed a deeper passion for equipping young leaders and the JV movement and are excited to be building a team to serve on the western side of Czech. You can write to Matt & Amy Hartman directly from this page.